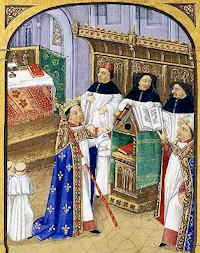 Historically today is the feast of St. Fulbert, Bisbop of Chartres, France, and a poet and scholar who aided the Cluniac Reform. 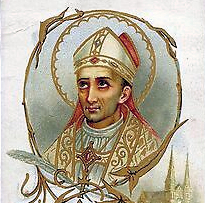 Born in Italy circa 952 or 960, Fulbert studied at Rheims, France, under future Pope Sylvester II. In 1003 he returned to France, becoming the bishop of Chartres in 1007. Fulbert rebuilt the cathedral there when it burned down and defended monasticism and orthodoxy. His hymns, treatises, and letter have survived. Fulbert's literary productions include 140 epistles, 2 treatises, 27 hymns, and parts of the ecclesiastical Office. His epistles are of great historical value, especially on account of the light they throw on the liturgy and discipline of the Church in the eleventh century. His two treatises are in the form of homilies. The first has as its subject: Misit Herodes rex manus, ut affligeret quosdam de ecclesia, etc. (Acts 12:50); the second is entitled "Tractatus contra Judaeos" and proves that the prophecy of Jacob, "Non auferetur sceptrumde Juda", etc. (Genesis 49:10), had been fulfilled in Christ. Five of his nine extant sermons are on the blessed Virgin Mary towards whom he had a great devotion. The life of St. Aubert, bishop of Cambrai (d. 667), which is sometimes ascribed to Fulbert, was probably not written by him. Fulbert's epistles were first edited by Papire le Masson (Paris, 1585). His complete works were edited by Charles de Villiers (Paris, 1608), then inserted in "Bibl. magna Patrum" (Cologne, 1618) XI, in "Bibl. maxima Patri." (Lyons, 1677), XVIII, and with additions, in Migne, P.L., CXLI, 189-368.